Like the poster? Then you will love the film! As part of their Kartemquin Summer Series in honor of our 50th anniversary, the University of Chicago's Doc Films (1212 E 59th St, Chicago, IL 60637) will screen Typeface (2009) on July 28th at 7pm. This is the first screening in Chicago for several years of director Justine Nagan’s award-winning film about the Hamilton Wood Type Museum in Two Rivers, Wisconsin, and we’re marking it with a special panel discussion about the intersection of modern design and traditional technique. Dennis Ichiyama, who is featured in Typeface and is a legend in the field of design (and also designed the film's poster that you see on this page), will be joined by Bob Zeni of The Society of Typographic Arts, and Starr Marcello, the film's associate producer and now COO and Executive Director of the Polsky Center for Entrepreneurship and Innovation at the Booth School of Business at U Chicago. 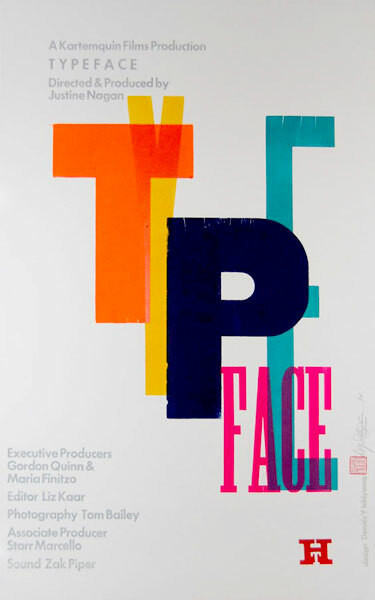 Ichiyama’s typographic prints and designs have received national awards and have been exhibited in the United States and across the globe. His works can be found in libraries and collections around the world, including Columbia University, American Academy in Rome, San Francisco Public Library, Zurich’s Kunstgewerbemuseum, and Columbia College Chicago. He is also featured in Typeface, as he was the first Artist-in-residence at the Hamilton Wood Type & Printing Museum in Wisconsin in the spring of 2000. The Society of Typographic Arts has been a vital participant in the Chicago design community, sponsoring seminars and conferences, and developing publications to promote high standards and focus on the art and craft of typography, design, and visual communication. Zeni is the Archive Advisor, has chaired STA's Archive, the country's only major juried competition devoted to the art and craft of communication design, for over 5 years. Starr Marcello manages the day-to-day operations of the Polsky Center, oversees all programming and educational activities, and focuses on development and fundraising initiatives as well. She has worked as a grantwriter and editor for the Chicago Film Archives and is an annual filmmaking and screenwriting judge at the NYC Midnight Movie Making Maddness film competition in New York City. We hope to see you at the screening on the 28th at 7pm! Get more details here.